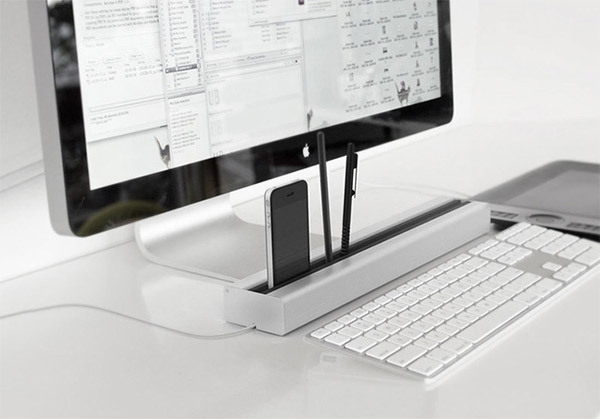 Desk Rail Keeps Your Desk in Line, Literally. If you’re like me, you’ve got lots of stuff scattered across your desk, and it looks like quite a mess. I’m always on the hunt for ways to keep things in order, and I think I may have found something worthy of placement in front of my 27-inch iMac. 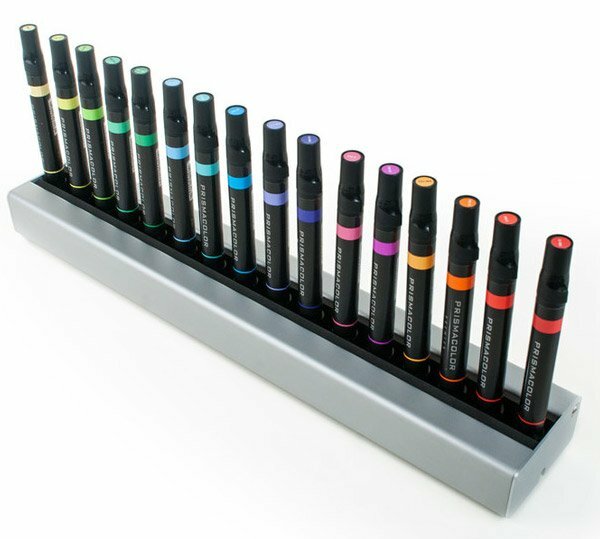 The Desk Rail embraces the “less is more” school of design, providing a convenient desk organizer in what amounts to an anodized aluminum channel, with a grippy foam lining. 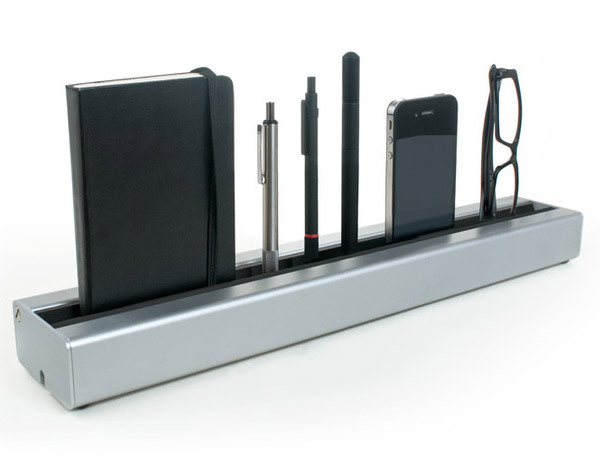 This simple design allows it to hold on to everything from smartphones to pens to eyeglasses to small notebooks. Plus, it measures 16-7/8″ wide – exactly the same width as Apple’s Extended Keyboard. On the bottom of the Desk Rail, you’ll find silicon feet to prevent it from scratching your desk and providing clearance for your keyboard’s cable. Weighing in at 2.5 pounds, it’s also unlikely to slip around. It’s even got room for you to run charging cables from either end of the rail, thanks to moveable doors with a small cable cutout. This ingenious design eliminates the need for a docking stand for your gadgets – which I always thought were a rip-off anyhow. If you head over to Kickstarter and order right away, you might still be able to get one of the early bird specials for the Desk Rail, and pay just $55(USD) like I did. Otherwise, it’ll cost you $65. In either case, there’s a $10 shipping fee as well. There’s also a limited-edition anodized black version that sells for $135, and a crazy-wide 36-inch version for $185 if you need lots of space.